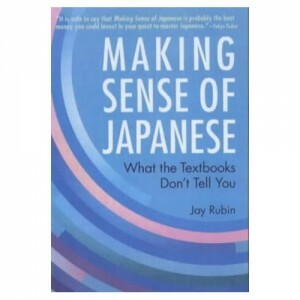 Making Sense of Japanese by Jay Rubin is a book of essays from Kodansha International that help you to understand how the Japanese language works. The subtitle of Making Sense of Japanese is “What the Textbooks Don’t Tell You”; it is full of detailed explanations of tricky grammar points and also includes examples that illustrate how to avoid common errors when translating to-and-from Japanese. Jay Rubin is well known for translating Haruki Murakami’s many best-selling novels into English but he’s also professor of Japanese literature at Harvard University. Lots of the essays in Making Sense of Japanese cover topics that his students at Harvard have found particularly difficult such as understanding the difference between the particles “wa” and “ga”. The retail price of Making Sense of Japanese is $16.00. Get it from Amazon for just $10.88 and save 40%!